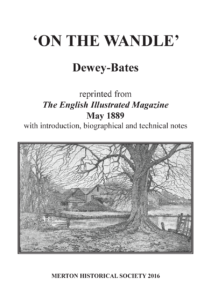 In On the Wandle Dewey Bates takes the reader on a notional journey beside the Wandle, downstream from Beddington and Carshalton to Wandsworth. The jovial and loquacious antiquarian, as Bates labels him, whom we first meet in the coffee room, and take our leave of beside watercress beds at the end, may have been a real person, or may have been simply a neat literary device to frame the narrative. This works well, but, unfortunately, readers should be aware that the antiquarian cannot be trusted on matters of historical fact or on derivations of place- or river-names. For instance: the Wandle takes its name from that of Wandsworth, rather than the other way round; the first element of Carshalton derives from cress rather than cross; while no-one now believes that our Merton was the Merton where Cynewulf, king of Wessex, was killed. The reader is warned to treat this aspect of the article with caution. for the magazine (see Appendix p.26), ‘On the Wandle’ appearing in May 1889.
the Wandle, downstream from Beddington and Carshalton to Wandsworth. that our Merton was the Merton where Cynewulf, king of Wessex, was killed. The reader is warned to treat this aspect of the article with caution. All in all, this article is an attractive and interesting chapter in the Wandle story. was an error, as his surname was Bates, and his sole Christian name Dewey. church tower and the gables of a large red-brick house. grass grow in the streets of once flourishing towns. bore great navies are now sluggish and covered with green from disuse. The link between the past and the present here has not been quite severed. cattle feeding; such a picture as you might find along some Dutch canal. out, a melancholy thing between its mud banks, to join the Thames. appearance in a culvert under the railway, near the old church at Croydon. and Beddington, which contribute to form the Wandle. which form that great pond in the centre of the town. the denizens of a suburban stream, are still captured by the expert angler. yet we have begun, as Goethe says, to eat our bread in tears. by Osric and Weverth, his faithful adherents. Statutes of Merton. The abbey was suppressed in the reign of Henry VIII. of Captain Cook, placed there by his wife, who lived here. crosses the London high-road, lived the author of Robinson Crusoe. Wandsworth, with the canal on one side, it loses itself in the greater river. London the products of the mills situated along the valley of the Wandle. railways have since, of course, diverted the traffic into other channels. it, but its case has even been before the House of Lords. ending his miserable life at last by suicide. the ripples they created were sending long lines into the inverted picture. from Philadelphia at the time. provided the woodcut illustrations for the society’s pamphlet on hailstones. noted on the back of the picture, together with ‘Finished June 31st 1869’. as his ‘sworn Acquaintance’, to guarantee the truth of Dewey’s statements. grey, Nose: prominent, Mouth: small and full, Chin: round, Face: oval’. Family money enabled Dewey to study in Europe between 1873 and 1875.
attempt to translate a Dutch pub sign (published posthumously in 1903). Clausen, 19 Moore Park Road, Fulham, SW’ as his address. friend in casual pose, in a studio, but wearing outdoor clothing. of specific works of art. … [but] shows cleverness.’ At least they were mentioned. entertainers. One was of M Marius17 half-length in morning costume. artistic studies on a small scale’. resulted mostly in paintings of children and pet dogs, rather than adults. months (1889), a water-colour of a boy with pet greyhound and toy whip. of a naughty white terrier. Jefferies20 in the August 1887 issue of TEIM. had been executed while he was at the house, indicating a lengthy stay. House, Flag Lane, Cookham Dean, from 1885 until 1891. Dewey was also living (about a mile from his old studio in Fitzroy Street). and Daydreaming, an 1886 oil of a girl sitting in the grass of an orchard. SBA, and Dewey submitted more articles and illustrations to magazines. humour into the subject’, from the Leamington Spa Courier. though no review mentions the pictures. enquiry to George Clausen, asking if Dewey was the right man for the job. from Southampton directly to New York, arriving on 30 November 1895.
few coins. He resolved to auction off his juvenile drawings and prints. the Kansas Times and Gazette. tales, died in East Sussex Hospital on 24 August 1898, at the age of 46. Hastings Borough Cemetery in plot DD.P23, without a memorial stone. retirement home in Hastings on 2 January 1948, at the reported age of 88.
a granite Celtic cross as a memorial. and Graphic as one of the best portraits of the year’ [not exactly true]. copy-engravers tried to reproduce his paintings. obituary is not that of a tramp. professional researches in the Rye area. Dewey Bates’s wife died in 1948. She bore the Christian names Kate Mary. and a similar style has been used for most of the other wood engravings. Edward Stanley Gascoine, fl. 1865–94, 168 Fleet Street, EC (1884–94). gives his Christian names as John James. Controller, Pacific Railroad Commissioner, twice Governor of Pennsylvania). manufacturer of muskets during the American Civil War. and inches could differ considerably from the English. studied at the London Royal Academy, of which he was neither student nor member. He did, however, offer works at several RA Summer Exhibitions. 1874–75, so the visit must have been earlier. in competition with the Royal Academy. Gallery website). He had been studying art in Paris at the same time as Dewey Bates. W E Gladstone, as Prime Minister. admired painter of the Maine coast. the Philadelphia locale of the artists satirised therein. the foremost female American artist of her generation. Coburg Place, Bayswater, 1884–1887 (as a sole trader). He died in Paddington in 1887. Information from John W Brown, pers.comm. January 2015.
popular French actor, comedian, singer and stage manager. in 1879 (with Marius), and Audran’s Olivette in 1880.
profitable business. His estate was valued at over two million pounds in 1903.
and scholar, and editor of the Magazine of Art, published 1887–1904. This entry was posted in Publications, Booklets, Publications and tagged in 19-century Merton, 19-century Morden, merton, merton abbey, merton priory, mills, mitcham, morden, victorian mitcham, wandle.